Arthurian legend has proven to be the driving force behind Avalon. For the uninitiated, Avalon is the mythical island where it is said that King Arthur’s iconic sword, Excalibur, was forged. Players can experience the legend for themselves by trying the Avalon slot over at Microgaming casino online. Avalon is an older release from Microgaming, but the slot has since gone through a major upgrade and there is now an HD version available. At this point, it can also be revealed that the Avalon slot is compatible on major operating systems, including Windows, Apple, and Android. After loading up Avalon, players will see that the slot is constructed in the trusted array of five reels by three rows. Playing cards and a range of Arthurian trinkets are then used as the symbols that can spin and be matched up over the 20 paylines. Avalon is great for providing close control on wagering decisions. This starts with players having the ability to assign a coin value of €0.01 to €0.50. The total number of the coins can then be allotted from one up to 10. • Avalon wilds: the Avalon wilds are included to substitute for every other symbol except for the scatters. Getting five wilds on a payline is worth 3,000 coins. • Lady of the Lake scatters: these ultra powerful symbols can provide a colossal 40,000-coin jackpot when five can be matched on a single payline. • Free spins: landing anywhere from three to five scatters will ensure that players receive 12 free spins to support their quest. 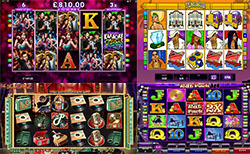 • Gamble: take the risk of gambling winnings on the flip of a card to try and earn even more. To win, players have to successfully call red or black. The case for playing Avalon at Microgaming casinos is that the Lady of the Lake scatters carry immense power. Most players will quickly come to appreciate the free spins, but the scatters also have the potential to trigger the immense 40,000-coin jackpot. Finally, it’s also worth trying the Avalon HD slot to experience the game with vastly improved graphics.